A Kinlochleven-based woman has performed in public for the first time after undergoing gender reassignment surgery – and believing she would have to give up performing forever. After a hiatus of some years, Sarah Fanet performed an intimate and uplifting gig at Watercolour Music in Ardgour surrounded by the many people and characters her yet-to-be-named album was inspired by. 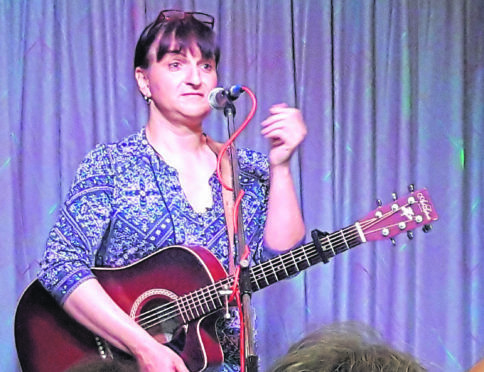 But for French-born Ms Fanet, who moved to Kinlochleven three years ago, the gig was a powerful moment she claimed gives a message of hope to others who are making life decisions. She said: “People often tell the story about the change that takes place from one gender to another, but what I want to say is that life goes on, and life is good. “I gave up performing before my surgery, at one time I would have been performing regularly throughout northern France. Ms Fanet, a classically trained guitarist, plays various instruments including the harmonica, and also sings. She was accompanied on stage by Sally Simpson, a Scottish/Irish fiddle player, who has worked on the album with Ms Fanet. The songs played before an audience of more than 40 people speak of the life and community in and around Kinlochleven, including stories of the Syrian Refugees who have moved to the village, and those Ms Fanet has befriended. Ms Fanet’s music infuses the stories of the ordinary with the extra ordinary things that seem to happen in the village. One song, Gail of the Glen, is the tale of a single woman and a lorry driver who falls in love with her. In Breathe she sings of a campaign to get health care for her friend who needed a lung transplant, but believed because of where she lived, was unable to have one. There was an NHS requirement that anyone needing a transplant would have to be within five hours of the hospital – and living in Kinlochleven made that impossible. Working with Ian Blackford MSP, the woman successfully had a double lung transplant five weeks ago – with a helicopter laid on to get her to hospital in time.